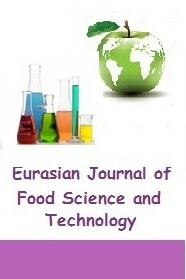 The Eurasian Journal of Food Science and Technology (EJFST) is an open access & peer reviewed international journal that publishes original research articles, short papers and critical reviews on all aspects of Food Science and Technology. The EJFST Journal publishes the articles in English and is being published 2 times in a year. The Journal is a multidisciplinary journal and covers all fields of Food. It is the main purpose of the Journal that to convey the latest development on the Food Science and Technology towards the related scientists and to the readers. The Journal is also involved in both experimental and theoretical studies on the subject areas. Submission of an article implies that the work described has not been published previously and it is not under consideration for publication elsewhere. All the responsibilities for the article belongs to the authors. The publications of papers are selected through double peer reviewed to ensure originality, relevance and readability. The journal publishes articles without any charge or fee. Internationally profound journal that Publishes articles on various disciplines of food and Nutrition. Thorough Double blinded peer review. Prompt Acknowledgement after acceptance of article for peer review. Rapid Publication after the article is peer reviewed through eminent reviewers. Acceptance and Publication of papers with excellence, novelty and originality. Issue of Publication Certificate to author. High visibility of your Published work.